Wildflower meadows of North American native wildflowers and grasses have been billed as a low-maintenance, earth-friendly way of planting that doesn’t call for fertilizers, herbicides, pesticides or extra watering. But do they really work in practice? Yes, if you start out properly (researching the process and following each step carefully), but like all gardening, it requires effort and money and isn’t entirely carefree. Mostly, it takes patience – the real show of flowers takes three years to get going. Meanwhile, you will find (as we did) that your neighbors are skeptical. Why plant a wildflower meadow? Our planting of wildflowers and grasses (shown here) is an amazing blaze of color each summer. It’s enormously popular with birds and butterflies, and has become my favorite place to photograph from mid-July to September, especially when the butterflies come. The idea seemed a natural fit for us after we bought our 10-acre country property in 1998. Our farm had a hayfield on a sunny, open site that was cut each summer by a local farmer. This field took up more than half of the property, and we wanted to reclaim the land for ourselves. Our plan was to plant trees and shrubs on part of it, and much of the rest would be lawn. I don’t mind lawn, but planting grass over the entire area seemed excessive, so we decided to add a wildflowers to a two-and-half acre portion of the property. From my research, I knew that one of the big concerns with growing wildflower meadows from seed would be competition from weeds. I had read about Paul Jenkins and Miriam Goldberger of Wildflower Farm, who had experience sowing wildflower meadows. Their method includes planting a nurse crop of annual rye grass to deter weeds without choking out the emerging native grasses and wildflowers. This made a lot of sense to me, so I contacted them for a site assessment. In the meantime, the summer before, we made an agreement with the local farmer who took off the hay to help with the changeover by plowing the field and growing soybeans on it for one season. Mid- to late April: We prepare the site ourselves with a rented tractor-pulled tiller and then smooth it with a harrow. Early May: Paul arrives with the seed and Brillion seeder to do the sowing. His seeder has two compartments, one for flower seeds, and second for the grass seed, which is fluffier. At the same time, grass seed (we chose Eco-Lawn, a low maintenance mixture of fescues, also supplied by Wildflower Farm) is planted around the meadow area and in the rest of the field. 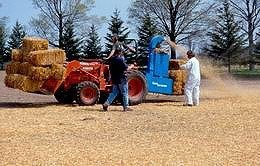 After seeding, Paul and his team mulch the area with straw, which serves two purposes, to keep the soil moist and help prevent germination of annual weeds.